- Come with ceramic antenna. - Use the USART TTL or IIC serial for communication. - Serial port baud rate default: 9600,4800 and 38400 optional,NMEA communication protocol. - Compatible with a variety of flight control such Rabbit,MWC or Pirate FC. 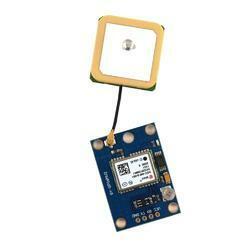 Description: This GPS Receiver SKG13C With External Active Antenna is easy to use with PC or MCU. The Skylab SKG13 series is a complete gps receiver module that features super sensitivity, ultra low power and small form factor, Dual Power Source. The GPS signal is applied to the antenna input of module, and a complete serial data message with position, velocity and time information is presented at the serial interface with NMEA protocol or custom protocol. It is based on the high performance features of the MediaTek 3329 single-chip architecture, Its -165dBm tracking sensitivity extends positioning coverage into place like urban canyons and dense foliage environment where the GPS was not possible before. The small form factor and low power consumption make the module easy to integrate into portable device like PNDs, mobile phones, cameras and vehicle navigation systems. Looking for GPS Receiver and GPS Tracker ?